Concrete has exceptional compressive strength, the capacity to support tremendous sums of weight. Compressive strength is the amount of pressure required to crush concrete. As a simple rule of thumb, the greater the sum of aggregate in a concrete mix, the greater the compressive strength. Relative to the compressive strength, the tensile strength of concrete is significantly less. Tensile strength is a measure of the chemical bond strength between the cement, aggregate and sand in a concrete mix, the amount of force required to pull concrete apart. Concrete tensile strength is a measure of how well concrete stays glued together under torqueing, bending and twisting pressure. It is because of concrete’s weak tensile strength that it must be reinforced with reinforcement bar (rebar) or wire mesh. Weak tensile strength is also the reason concrete additives like fiber and potash are used to supplement concrete mixes. As such, it is as important to understand reinforcing materials as it is to understand concrete mix ratios. Rebar is the most common reinforcing material and provides the most strength in concrete. The reinforcement potential of rebar is determined by the size of the rebar; the type of rebar; and the spacing of the rebar. Staining concrete is becoming one of the most popular applications for interior floors in homes, offices, restaurants and other public buildings. 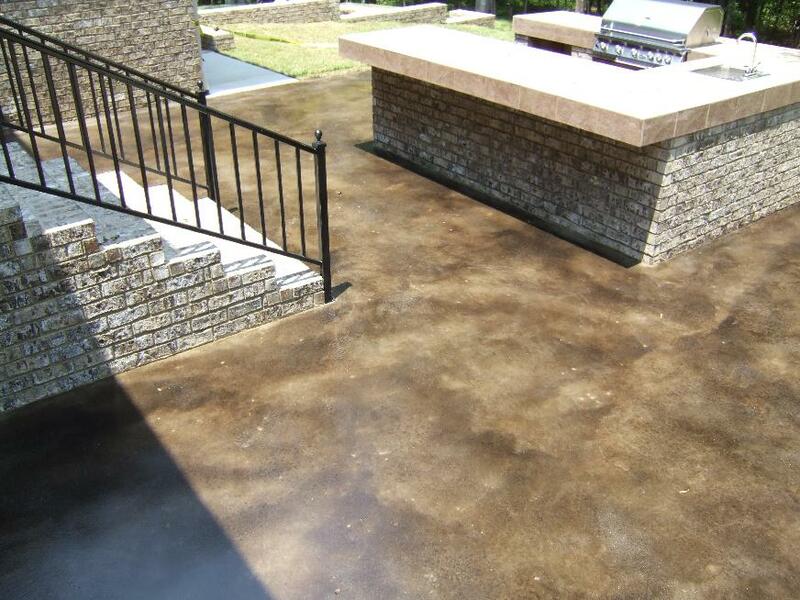 Acid stained concrete is an affordable application that requires very little maintenance so it is easy to understand why more and more people are starting to stain concrete outdoors. It is affordable, low maintenance, you can stain an exisiting slab and the color scheme is endless. Our company has started to stain patios, garage floors, outdoor kitchen areas and even some driveways. We are seeing more and more people wanting to put added detail into their outdoor living space and acid staining is a great way to do it. Acid staining uses a chemical stain mixture of hydrochloric acid, acid soluble metallic salts and water.